Unix command line users around the world rejoiced when Microsoft announced recently it would be bringing the popular Bash shell to Windows 10 with a forthcoming update. Last Wednesday, the company released a beta build of its operating system that finally had support for the new functionality. To get it working, users have to jump through a few hoops. First, the system is only available right now for users who have build 14316 of Windows 10. 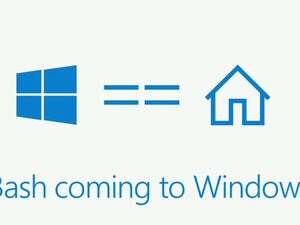 To get it, a PC has to be a part of the Windows Insider Program's Fast ring. After installing the beta, users have to toggle Developer Mode on in Settings > Updates and Security > For Developers. From there, they have to open up another settings pane, check the "Windows Subsystem for Linux (Beta)," restart their computer, and open a DOS command prompt and run the bash command. 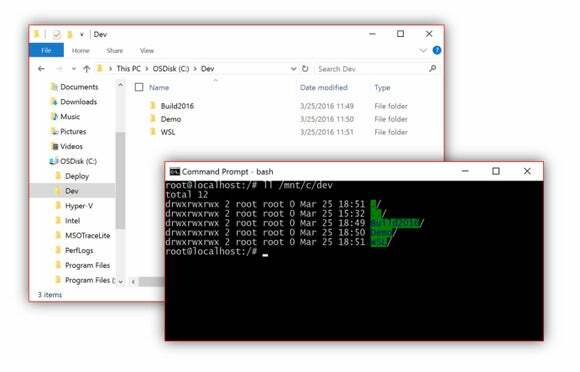 Windows 10 will then prompt them to confirm they want to install the Bash beta and run through an installation process before starting up the Linux subsystem with a Bash prompt. It's an arduous process, but once everything is said and done, users are left with Bash on Windows. Seriously. It's still beta software and there are definitely bugs -- top caused the whole system to lock up, and using apt-get to install Emacs hung once before it actually worked. But overall, it's responsive and useful in early tests. There's one other finicky tidbit -- while the Bash prompt shows that it's being run as a superuser, its permissions are still tied to the active user account unless it's launched using the "run as an administrator" option in Windows. That's something Microsoft promises to change in the future, so users will have user-level permissions and then be able to use sudo to elevate themselves to superuser status when necessary. Microsoft still has more tricks up its sleeve when integrating command-line developer tools with the open-source ecosystem. The company plans to bring more shells to Windows, so fans of csh and other environments will have something to play with, too. What's more, the popular PowerShell scripting tool may be making an appearance on Linux. Jeffrey Snover, a technical fellow at Microsoft, coyly hinted at the possibility of porting the tool over to Linux during an interview at Microsoft's Build developer conference earlier this month. There's been a lot of demand for PowerShell on Linux, he said, but it hasn't been done before because .NET wasn't available on Linux. Now that Microsoft has open-sourced that development environment, however, the possibility is on the table.